Kimi Raikkonen and Ferrari look in ominously good form ahead of Sunday's British Grand Prix. The Finn, who won in France last weekend, was comfortably quicker than team-mate Felipe Massa and both McLarens in Friday's second practice. 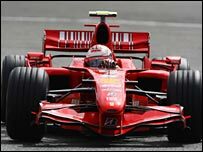 Raikkonen's best lap of one minute 20.639 seconds was 0.449secs quicker than Massa. Lewis Hamilton was fourth fastest nearly 0.75secs behind. Hamilton's McLaren team-mate Fernando Alonso was down in sixth. Hamilton, who leads the world championship by 14 points, had been fastest in the day's first 90-minute session, with Raikkonen and Massa just behind him. Despite having a less successful afternoon, he was happy to take positives from his morning's display. "The first session went well," he said. "I don't know what fuel loads everyone was on in the afternoon, but we weren't focused on going out there to be fastest. We'll have to go back through the data, but I'm quite optimistic - I still think we'll be able to battle with the Ferraris." Alonso had the edge on Hamilton early in the morning session, but failed to keep pace as the day progressed. The world champion ended the session 0.575secs adrift of Hamilton, and was 0.317secs slower in the afternoon. As often happens in Friday practice, slower cars appeared in among the Ferraris and McLarens at the top of the times as the teams went about their programmes evaluating different set-ups for the race. And despite the Ferraris' apparent superiority, it is notoriously difficult to predict form from the Friday times as the teams do not reveal the specification in which they run their cars. In the afternoon, Ralf Schumacher's Toyota - which will almost certainly struggle to make it into the top 10 on pace - was third fastest. His team-mate Jarno Trulli, who was eighth on the grid in France, was fifth, ahead of Alonso. Williams's Nico Rosberg was fifth fastest in the morning session, nearly a second behind Hamilton. The BMW Saubers of Robert Kubica and Nick Heidfeld were next, followed by Rosberg's team-mate Alexander Wurz and the Toyota of Jarno Trulli and Englishman Anthony Davidson's Super Aguri. Strong winds made conditions tricky for the drivers at the exposed Silverstone circuit, and several had spins. Among them was Scot David Coulthard in the Red Bull, whose car is sporting a new livery for this weekend. Coulthard ended the first session 18th. In the afternoon, after it had been announced that he would be staying at Red Bull for another season, Coulthard moved up to 14th. Englishman Jenson Button had to sit out the afternoon session for treatment on a bad back. His compatriot Anthony Davidson was 10 th for Super Aguri, behind the Williams cars of Nico Rosberg and Alexander Wurz and Coulthard's team-mate Mark Webber.